Designer Chiyu Chen has conceived of an ingenious transit system that encourages the use of sustainable transportation by crediting people for renting and riding bicycles. His Hybrid2 system consists of a fleet of rentable bicycles that are capable of generating and storing kinetic energy, which is then used to power the city’s hybrid electric buses. 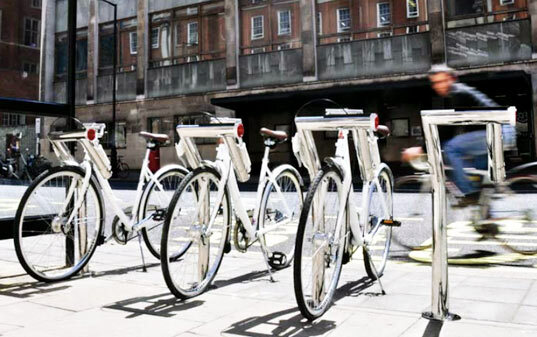 Simply rent a bike, charge it up with kinetic energy from pedal power, and then return it to a kiosk - the station feeds energy into the city’s smart grid, and you receive a credit towards your next bus pass! The core of Hybrid2 is Chen’s regenerative braking system for bikes, dubbed “Hybrake”, which allows riders to generate and store energy from braking and normal biking in an ultracapacitor. In Chen’s vision, the more energy a bicyclist generates, the more monetary credit they are given to use on public transportation. 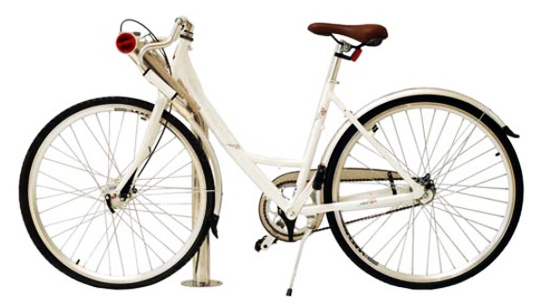 The designer also proposes a solar-powered bike stand outfitted with an RFID card reader to lock and unlock bikes. Personal ID cards will be used to store credit gained from biking for future bus rides, and the whole thing is tied together with a hookup to transfer energy from bikes to the smart grid. Sounds like an ingenious plan for any city trying to reduce traffic congestion!